Left to Right: Pat Meagher Commercial Director, William Carey CEO, Roberta Delaney CFO, Bill Carey MD, Mary Newman Julian Fine Gael Dáil candidate for Tipperary, Mr. Simon Coveney Tánaiste and Minister for Foreign Affairs and Trade at Irish Government, Garret Ahearn Fine Gael Dáil candidate for Tipperary and Michael Carew North America + Canada Sales Director. 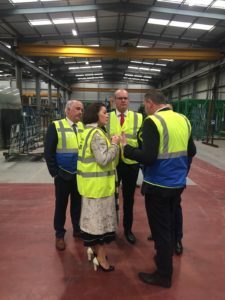 With two additional plants, one based in Co. Armagh, Northern Ireland and one in Chester, UK, bringing the total employment figure to almost 800,the impact of Brexit is of great concern to Carey Glass, and they were delighted with the opportunity to discuss possible Brexit implications with Minister Coveney. The Minister for Foreign Affairs is the key Government Brexit negotiator. 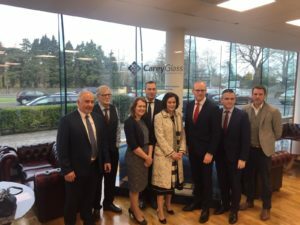 Mary Newman Julian said ‘The senior management at Carey Glass had the opportunity to discuss their concerns with regard to Brexit, amongst other issues, with the Tánaiste today, and Minister Coveney welcomed the opportunity to meet with many of the Carey Glass team in Nenagh.